OY VEY !! Can he meet me tomorrow? Love how on the ball you are! A very nice spring day finally…. but unfortunately have to work. Our bookkeeper made a quick recovery and arrived to work this am. Hopefully, she will be able to finish her work this week and continue her recovery. Also, I was very pleased with your very good communication and timely response. Good to know there are good professionals that can assist. Great job Jason! The hiring manager is interested in interviewing both candidates. At this point I’m waiting for his availability for the remained of the week, and to confirm if they will be telephone or face-to-face interviews. I just wanted to take a moment to say thank you for working so diligently to try and help us find the perfect fit for the position. It has been so difficult to find someone who is as solid of a match as possible to fill this slot, and you have been working so hard to try and do just that. I wanted you to know that I appreciate your efforts and understanding in what is a very difficult undertaking. Thank you for being outstanding at what you do! I wanted to take a moment to thank you for your efforts on our behalf to fill this position and to say I will look forward to working with you in the future should other openings arise. By the way, you are the only recruiter I actually like because you are not too aggressive. People have been calling me all day! BTW, you guys completely rock. I have this out to three other agencies and you are the only one who has been quick to respond. Thanks! Thanks so much for sending us really qualified people. We have been through several staffing agencies and you guys are the best…hands down! You actually give us what we ask for. Your candidate is working out great! Thanks again Jason! Just heard from the manager that your candidate is on site. Thanks a bunch for all your help! You and your team were great and it’s greatly appreciated! This writing is a reference for the excellent service provided by Accountants For You. AFY took a great deal of time to learn about our organization and the specifications we had for the candidate. They carefully selected, and presented “just right” candidates for our evaluation. Our company was successful in filling the open position with a candidate provided. I recommend, with out reservation, their outstanding service. We were having trouble filling what we thought would be a relatively ‘easy’ accounting position. Jason was able to find a candidate that had not only the right qualifications and background experience, but also fit well within our environment. 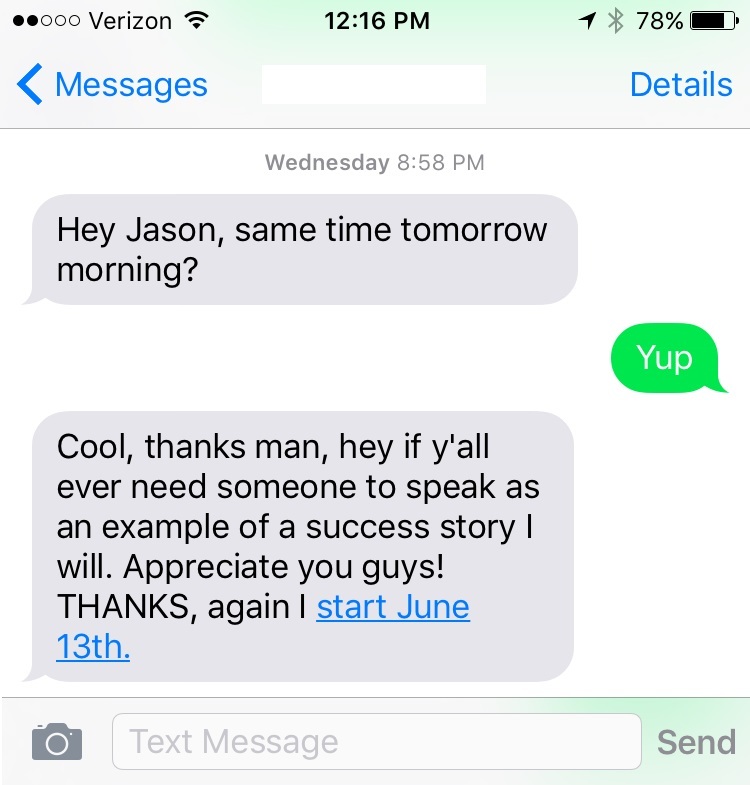 I was searching for more than a year prior to being contacted by Jason. He was incredible in locating me the appropriate opportunity for my broad based experience. His enthusiastic​, yet laid back personality made him a pleasure to work with and negotiated an excellent deal for both the client and myself. The client was so thrilled with my placement that they want me to use him exclusively as the business grows. I would recommend him to anyone who is tired of the typical all talk and little action recruiters who seem to have flooded the industry. He is a true professional. Jason is both a professional and a gentleman whom I only met over the phone. 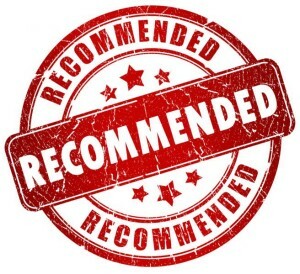 I am recommending Jason to any executive, officer, director or staff individual seeking a new opportunity themselves or seeking very qualified candidates for any Company. I have had the privilege of being represented by Jason in both capacities/situations. I support Jason Libes for his character, professionalism and genuine interest and desire toward complete customer/client/applicant satisfaction. I recommend Jason for who he is and what he represents, and not necessarily the “who” he is currently working for (whomever that may be at the time of your reading). I just want to say that Accountants For You is a great staffing agency to work for. The Libes family have been absolutely wonderful. They have gone out of their way and made special accommodations for me when I was in a time of need. Jason Libes reached out to me after searching resumes to fill a role as an Administrative Secretary for one of their clients in South Jersey. I could not be happier. The person I report to and the people I work alongside are very nice and team oriented. I have been with other agencies in the past but Accountants For You is by far the best agency on knowing where to place you. They are very understanding and the Agency is very friendly. I would highly recommend them to a friend or family member. Thank you so much for contacting me about possibly returning to work this year with the XXXXX Program. Though, I’m retired and I truly enjoyed working with you last year, I have decided not to return this year. I want you to know personally, how much I appreciated working for your agency, OfficeStaff For You. 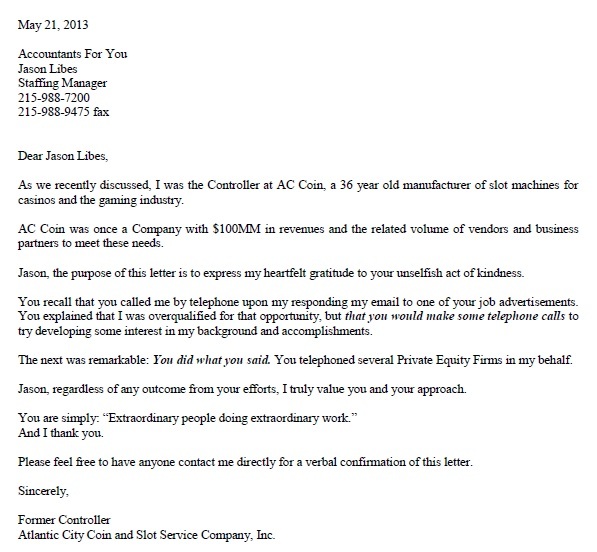 Your company is extremely professional which made what I did a pleasure. Being retired since 2013, I needed to see if I truly could do 9-5 again. I enjoyed it. I like assisting and working with the public and will be continuing in that area of employment. I wish you and your staff continued success with all you do. Who knows what will happen down the road. I believe in keeping the doors open and staying in touch! Thank you for the time spent reviewing my career objectives and giving me the opportunity to achieve them. I appreciate your help and attention over the past week with matching my qualifications with the needs of your clients. I am extremely excited about coming on board at my new position and look forward to using my eight years of accounting experience and proven areas of strength to allow me to actively step in and help the department achieve its goals. Again, thank you for your help and assistance. I am positive that we can move ahead together and look forward to building a strong foundation that will hopefully one day lead to a permanent position the client. Sorry I haven’t been in contact until now. My new employer has been keeping me really busy. We just finished up payroll taxes today, so now I can breathe just a little. I have wanted to write you a thank you for finding this opportunity for me. So far, I just LOVE it here. The people are so nice. I especially like the Controller. She’s an intelligent woman and very down to earth. We seem to get along very well. I told the person that I am replacing several times that I wish there was a way that he could stay and I wouldn’t lose my job. He and I work together so well. However, it is certainly to my advantage that he’s moving forward, as he puts it. I hope I still feel the same way in a few months. I have a strong feeling that I will. Thanks again for everything you did to put your client and me together. My first impression of you was probably much better than I left of myself. I was really impressed with you and your staff. You are very detailed and organized and certainly will bring the company the professionalism that you demonstrated. That was a breath of fresh air. Few recruiters present themselves with aura and confidence of understanding the market as you and your staff do so well. Thank you for the compliment, I AM a go-getter with high energy, a multi-tasker & far from lazy. I knew what needed to be done & was just hoping to find the right job & not take too long finding one. I was disappointed about Langhorne but I guess it wasn’t meant to be. I was able to get a position within walking distance from my home which helps for the first job returning to the workforce after being home all these years for my family. If I don’t like it there & the family adjusts well, I’ll be sure to call you. I did interview with a few recruiters but YOU & your organization seemed to be the MOST professional & I admire that. I WILL keep you in mind when the need arises or if I can refer anyone to you. Again, thank you for your time & opportunities given to me. I don’t think I can thank you enough for this. I am truthfully at home with my new company. Not to mention I still talk to all of my fellow Deloitte co-workers, I love it. I feel so connected and I’m learning so much already!! All is definitely well with me. I will keep my eyes and ears open for anybody who might be in good use of your service and professionalism. I became acquainted with Accountants For You on June 7, 2007. We discussed my experience, background and qualifications. AFY spent time learning about me and my goals. They called me the very next day and told me he had an opportunity. I interviewed and was hired within a week. I have been with my current employer for over a year and am very happy. I highly recommend the team at Accountants For You. My experience during their recruiting process was welcoming and consultative. They are ethical, trustworthy, thorough and knowledgeable. All are professionals! They are truly genuine people who build relationships and partners with both their candidates and clients. what I did a pleasure. Being retired since 2013, I needed to see if I truly could do 9-5 again. I enjoyed it. I like assisting and working with the public and will be continuing in that area of employment. I just wanted to express to you my sincere appreciation for you taking your family time to come meet with me on a Saturday. I think your advice was invaluable and I’ve already begun making the changes to my resume. I’ll send it to you once it’s complete. I am grateful for your guidance and your time. You were able to answer looming questions that I’ve had since I have started my job hunt so thanks for that. And I also appreciate your validation and renewed confidence that you gave me. I’m sure it will all help and all be evident in the new resume. I am confident that these are the tools I need to find a new job. Our work never stops! 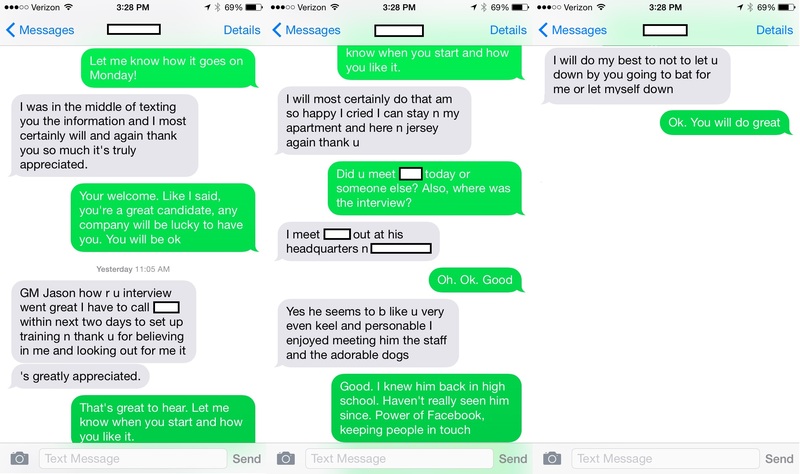 Check out this text interaction between our Staffing Manager, Jason, and one of his candidates! Here is another example of Jason and one of his happy candidates!